Protecting people, locations and assets is a critical part of any enterprise. Robust security surveillance systems are often inadequate or cost prohibitive, especially when it comes to locations with large square footage, very active foot traffic, or a high volume of transient visitors such as corporate campuses, event venues, transportation hubs and shopping malls. Luckily, we live in a world where everything and everyone is connected. Every person today emits and leaves behind a “digital footprint” that when combined with location, time and camera data, can be utilized to enhance premise security and safety. Today’s IoT solutions offer peace of mind to facility managers, security guards, and corporations across the globe. Nader Fathi is a serial entrepreneur and veteran of the Big Data and IoT industry. He is currently the CEO of Kiana Analytics, a Big Data company that helps brick-and-mortar businesses to strengthen on-site security and understand visitor behavior. He was CEO of SigmaQuest, a Big Data for Supply Chain solution, which he co-founded in 2002. Camstar Systems successfully acquired SigmaQuest in 2010 and Nader lead its Supply Chain Quality practice until 2012. 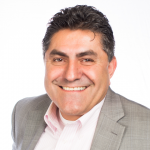 Nader mentors and advises startups as the Executive-in-Residence (EIR) at the University of Southern California Stevens Institute for Innovations and the Plug and Play Tech Center in Silicon Valley. He is currently on the advisory board of Glassbeam, Machine-to-Machine analytics. He has coached Big Data companies in various vertical markets including sports, retail, finance, health/fitness, and environmental analytics. Previously, Nader held executive positions at IntraStage, IKOS, Cadence, and Daisy systems. He started his career as software and chip designer at Xerox Microelectronics.Nader holds a bachelor and masters in electrical engineering from the University of Southern California and completed his coursework toward a Ph.D.